Our product range includes a wide range of military grade surveillance camera and 5 km ptz camera. 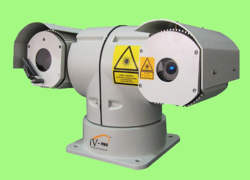 Military Grade Series long- range HD infrared laser imaging Camera is Designed for 24 hours monitoring. With super homogenizing NIR laser & low illumination megapixel telephoto lens. The max detection distance for human / car/Object is 1 Km in the day & 500 Meters in the Night Built-in technical grade embedded control electronic System, the camera Operation like Zooming , focusing, Video switch , rotation is stable & accurate. One integral aluminium alloy housing & weatherproof IP66 make sure it works well outdoor. DSS Digital Stepper illumination angle control, unique /zooming & Distance matching technology, min 0.1 follow up Zooming . GHT Super homogenizing & Power Consumption Control of NIR laser ensures a better effect. 360 Continuously Rotation PT, rotation stably. One integral aluminium alloy housing, IP66 ingress protection , Waterproof, dustproof. Oilfield monitoring, navigation, fishery, aquaculture, railway freeway security, seaport airport security. 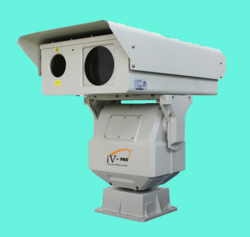 We Are The Leading Manufacturer And Suppliers of this iV-ML-PTZ-30X-iP3 Cameras in South India Such As Thiruvallur, Chennai, Kancheepuram, Vellore, Thiruvannamalai, Krishnagiri, Dharamapuri, Villipuram, Cuddalore, Salem, Erode, Namakal, Perambalur, Nilgiris, Coimbatore, Tiruppur, Karur, Tiruchchirapalli, Ariyalur, Nagapattinam, Thanjavur, Thiruvarur, Nagapattinam, Pudukkotai, Dindigul, Theni, Madurai, Sivagangai, Ramanathapuram, Virudunagar, Tirunelveli, Thoothukudi, Kanniyakumari, Hosur, Rajapalayam, Puduchcheri, Kerala. Military Grade Series long – range HD infrared laser imaging Camera is designed for 24 Hours monitoring. With Super Homogenizing NIR laser & Low illumination megapixel telephoto lens. The max detection distance for human / car / Object is 5 Km in the day & 2.5 Km in the Night Built- in Technical Grade Embedded Control Electronic System . The Camera Operation like Zooming, Focusing, Video switch, Rotation is stable & accurate. One integral Aluminium alloy Housing & Weatherproof IP66 make sure it works well outdoor. DSS Digital Stepper illumination angle Control, Unique laser Zooming & Distance Matching Technology, min 0.1 follow up Zooming. Independent laser Photo switch . 360 degree Continuously Rotation PT, Rotation stably. We Are The Leading Manufacturer And Suppliers of this iV-ML-PTZ-38X-iP3 CCTV Cameras in South India Such As Thiruvallur, Chennai, Kancheepuram, Vellore, Thiruvannamalai, Krishnagiri, Dharamapuri, Villipuram, Cuddalore, Salem, Erode, Namakal, Perambalur, Nilgiris, Coimbatore, Tiruppur, Karur, Tiruchchirapalli, Ariyalur, Nagapattinam, Thanjavur, Thiruvarur, Nagapattinam, Pudukkotai, Dindigul, Theni, Madurai, Sivagangai, Ramanathapuram, Virudunagar, Tirunelveli, Thoothukudi, Kanniyakumari, Hosur, Rajapalayam, Puduchcheri, Kerala. Looking for MILITARY GRADE LONG RANGE PTZ CAMERA ?